The lines are still in place at the start of the Grand Junction Railroad. Looking south from University Avenue. Sign just east of the trail at Harmony Road, announcing the back entrance to a golf club. Not to be confused with the line of the same name out of Boston, the Grand Junction railroad in Ontario ran from Belleville to Peterborough. It went through a number of legal wrangles from its inception in 1852 as the Grand Junction Railroad Company, changing its name in 1870 to Grand Junction Railway. In 1880, it acquired the Belleville and North Hastings Railroad (now the Trail of Two Lakes) and in 1881, was leased by the Midland Railway of Canada (dates are from the Railways of Eastern Canada web page). See the Rails to Trails page for a bit more history of this line. We'll follow the rail as best we can from its starting point in Belleville. The best place to start this walk is at the Belleville train station, built around 1856 according to the plaque, and one of only nine of its kind remaining in the province. If you are the cautious type (or perhaps, better, the sensible type) you may want to start on the other side of the tracks (see "How to Get There" below); if you start at the station, you have to cross multiple active tracks to get to the abandoned line. Once across the tracks, head right (east) and you'll see the abandoned line curving north. Follow it around to College Street. A more overgrown track runs off the main line to your left, but ends at College, where Cranford Metal has a wrecking yard. In fact, a mountain of metal sit in the path of this side track. The wrecking yard graces the left side of the main tracks as you walk by, allowing you to admire old truck boxes and car wrecks. From University, the track continues a short distance, passing under Highway #401. Again, walking is generally easier following a dirt trail to the left (west) of the tracks. If it's been wet, some of the trail will be washed out, as the ATV marks have made deep ruts. As you approach the bridge to Highway #37, it's a contrasting landscape on both sides. To the right, you'll see different piles of aggregate and some wrecked machinery. To the left is woodland, open field and swamp. Just over 300 metres from Highway #401, a trail heads off to the left. This runs just short of 300 metres up a hill to Black Diamond Road. The chain link fence on the left as you go up this trail protects the secrets of the Black Diamond cheese factory. Back Diamond, arguably the most recognizable Canadian brand of cheese, began its life in 1933 as Belleville Cheddar Cheese Limited, founded by Robert F. Hart. Originally Hart produced high-end cheese to sell mainly to the U.K. Today the company is part of the Italian-based multinational Parmalat that makes, among other brands, Astro Yogurt, Beatrice milk products and Black Diamond real and fake cheese products. Things to contemplate as you climb the hill to get a glimpse of the plant: Parmalat got itself into hot water in 2003, when it collapsed in Europe's biggest bankruptcy at the time. Financial fraud was also involved, and one executive was sent to prison for 10 years. The Italian government (as governments are wont to do these days when "fiercely independent" capitalists mess up) stepped in to save the company name. In short, the company behind the chain link and barbed wire fence you are walking by, has a fascinating historical record and was recently connected to equally fascinating shady international economic dealings. Pass the cheese. Once past the Highway #37 bridge (and the collected garbage dumped there) the tracks continue until a side track breaks off to the right. The main track comes to an end just before Tank Farm Road, in a tangle of underbrush. Be very careful in the summer if you want to inspect the iron buffer at the track end; poison ivy abounds in this area. Stay on the trail to the left of the tracks to Tank Farm Road. The rail bed will still be on your right. Cross Tank Farm Road and continue north on Short Street. The end of the actual tracks, just short of Tank Farm Road. Short Street is boring but it's, well, short. it intersects River Road at a sharp angle (River Road also runs north-south). Here, a homeowner has neatly mown the rail bed and you can cut across it if you want to avoid the road and cross by the old and rather dilapidated railway bridge, which runs directly beside the River Road bridge. However, after the bridge, you'll have to negotiate a few weeds before the trail opens at Cannifton road North, which runs east from River Road. You can see the trail on the other side of Cannifton and the Eastern Ontario Trails Alliance announcing it. This is the official start of this trail. The surface is crushed cinder which works well for both bicyclists and walkers. It also works for motorcyclists and ATVers. I met both. The motorcycles were moving at high speed in the evening light, so be aware. Soon after Cannifton Road, you'll see a water tower on your left. 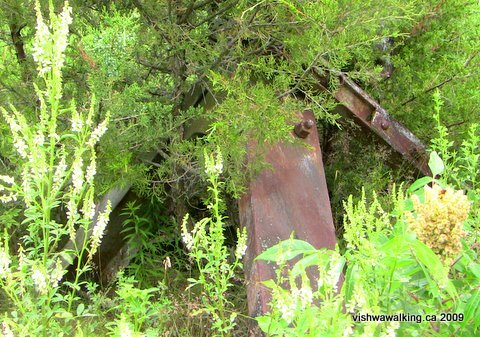 , followed by two cement block buildings with what I imagine is old pumping equipment and pipes. behind the buildings is the outline of what looks like a second water tower, and a series of what looks like well caps lies immediately to the north of that. These are some of the abandoned remains of Corby Distilleries. Corby Distilleries was founded by Henry Corby in 1859. Corby had a mill on the Moira where farmers brought their grain. At first it was a sideline; Corby took any surplus grain and made it into whiskey, which he sold back to the farmers. By the 1870s, the booze was more profitable than the milling business and Corbyville developed into a thriving community north of Belleville. Corby had a colourful life: He came from England to Canada in 1832 and set up shop in Belleville as a baker. He was involved in politics (including becoming mayor of Belleville in 1867) and was the captain of a steamer that ran between Belleville and Kingston. He also experienced tragedy: his first wife and three children were drowned while out on a sleigh ride in the bay of Quinte. His second wife died after bearing 12 children. He married a third time. In 1905, Corby sold the business to one Mortimer Davis, who was involved in the tobacco industry and the company became known as H. Corby Distillery Company Ltd. Shortly afterwards, Davis rebuilt it. In 1918, the company was sold to Canadian Industrial Alcohol Company Limited, a holding company with international interests. In the 1920s, with sales slumping, a sales manager was hired who opened the company to the U.S. market during the prohibition era. The company partially rebuilt itself on illegal sales, becoming for a while one of the largest distilleries in the world. By the 1950s, The company had over 80 buildings on about 23 acres and was doing a booming business. In the same year, because of the growing importance of the alcohol business, Canadian Industrial changed its name to H. Corby Distilleries.Co. Ltd. In 1968 the name was shortened to Corby Distilleries Ltd. In 1951, Corby moved its headquarters to Montreal, as both Canadian and international business boomed. In the late 1980s, the company was generating $80 million in sales annually. However, in the '90s, business dropped . The Corby history is not all sweetness and light. In 1982, the Ontario Ministry of the Environment charged the company $20,000 (pocket change for the company, I'm sure) for discharging waste into the Moira River, the very source it historically drew from for its water needs. In the mid-80s, Allied-Lyons PLC assumed ownership of Hiram Walker and Sons, which owns 50% of the Corby Distillery shares. In 1991, the Corbyville operations closed. One hundred and seventy jobs were lost. Bottling was moved elsewhere in Ontario and to B.C. and Quebec. Mergers and takeovers of Corbys and major international companies get complicated at this point. In 1998, the company moved its headquarters to the Heinzman Hall building in Toronto. One of Corby Distillery's main buildings is now owned by a company called Collins and Atkinson at 134 River Road, for which there is no ready information on the Internet. other buildings are occupied by municipal offices and there is a restaurant in a building by the river. On the east side of the trail is an old dam and a pond. I don't know for sure, but it seems logical that this was a source for Corby Distillery's water, which may have been pumped and stored into the tanks on the other side of the tracks. It's worth exploring. There are identical metal stairs over what is now rubble in a cement chamber, a water-filled cement chamber running next door to it and bits of machinery that suggest a pumping operation. An open pond lies to the east of the pumping/dam area. to the towers on the west side of the tracks. A little further on, Wiser Road comes in on the right from Highway #37. There are a couple of nice houses here, including an old stone house at the end of the road. Wiser Road ends at this point, but you can get to the rail bed from here. The trail at this point is very straight, but there is a line of trees and bushes that crowd the trail making it very pleasant. However, watch out for the poison ivy. There are fields behind the line of trees/bushes. On the left, the field seem to be now unused open meadow. On the right are active fields. As the trail closes in on Harmony Road, there is more forest. Then it opens and power lines stretch across the trail. Harmony Road appears 7.3 kilometres north of the start of the trail. At Harmony Road, there is a back entrance to the Black Bear Ridge Golf Club just to the left of the trail. The back side of the golf club is visible as you proceed north, with the club house sitting on a hill a few hundred metres in. Some years ago, walking down the Moira River bank when the course was being built, I came upon pipes leading to the Moira River. The mind boggles at the amount of water needed to keep these greens from turning brown. Then there's the pesticides... Hold your breath as you pass by. The trail curves off to the north west as more trees and forest with thick underbrush and bits of swamp close in. The trail widens and turns to gravel just north of Harmony Road. It's less pleasant than the cinder path, but still good. The trail by Homan Road has widened now, to become virtually a road. There are no clear signs indicating this is a trail here, so an innocent could be forgiven for turning onto it with his/her car at Homan Road. The rail bed rides high as it closes on the bridge across the Moira River. At points the trail is half the height of the trees. As the trail gets to the bridge, there is ATV destruction, with ad hoc trails on both sides of the steep embankments. On the left side just before the river is what might be described as an "alvar" — an open area with thin soil over limestone or marble rock, with not much vegetation. Much of the vegetation wedged into crevices is poison ivy. An "alvar"? The soil is thin or nonexistent here and there's little vegetation. Some of that vegetation in the crevices is poison ivy. Speaking of poison ivy, it abounds along the edges of the trail. Step off the trail at your peril. Just before the bridge, on the right hand side is an elaborate sign carved in rock. Beside it is a bench. The sign reads, "This section of the Riverfront Trail in memory of Elaine S. Magee, 1823-2001. 'Enjoy the view.'" This is somewhat confusing. The Waterfront trail in Belleville runs along the west side of the Moira River. This is the first indication it's in any way connected to the Grand Junction trail. vehicles depicted. Don't be fooled. ATVs are one of the main users of this trail. I could find no help from the Internet. Nor could I find any information on Magee. The Grand Junction Trail passes over the Moira here, but does not come close to it at any other point, so the "Riverfront" reference is a mystery to me. The views from the bridge, both south and north, are good. Someone was fishing on the south side when I passed over it. Notice the profusion of wild grape vines on the chain fences on the north side of the bridge. My early July walks have passed by lots strawberry bushes. It's slightly too early to be picking them, but they won't be long. At Mudcat Road, shortly after the bridge, there are residences lining the road and a couple back onto the trail. Note the old barn to the left. The trail moves through mostly hardwood from this point, but there's plenty of swamp and some fields in the background. It looks like some of the old fields are returning to bush at this point. Check out the big old maples and other venerable trees on both sides of the trail here. At Old Madoc Road, I chatted with a couple of friendly kids and watched them jump ramps with their bicycles. Although I had my bike with me (for the return journey), I chose just to watch. For me to take on a bike ramp would spell disaster. Old Madoc Road is a kind of "rural suburb," with suburban-style houses with trim lawns lining both sides. The trail here is more like a small country road. This continues for some time, often with enough room for two ATVs to pass. Forest is on both sides — but it's mostly fairly swampy, with open water at spots. This is part of a network of marshland connected to Chrysal Creek, which empties into the Moira River to the east, and Paliser Creek which empties into the same river further south and west.. About 900 metres from Old Madoc Road the rail bed crosses Highway #62 and you can see a huge marsh on the south-west side connected to Paliser Creek (or Palliser, spellings differ), with a flow that heads south-west, then cuts back east to empty into the river. It's a confusing labyrinth of waterways. Chrysal Creek, which is further north than Paliser, has a tributary that follows the east side of the rail bed for some time. On the west side of Highway #62, the trail follows Smith Road (which is to the north) for a short while. Smith Road then cuts north and a rough trail heads south across the trail. Smith Road then turns sharply west, crossing the trail, which has been cutting through forest with fields not far away. After Smith Road, we get a glimpse of a field or two. The marsh backs off a bit, and some pine forests appear. The trail cuts into the side of an embankment and there is a planted pine forest at one point growing on a steep hill on the east side. Smith Road on the left side. As you pass over Halloway Road, you'll notice houses first through the trees on the left side, then, after you cross the road, on both sides as the trail parallels Halloway Crescent. The trail now curves around to Dutch Girl Road. The stream to the left, at least after several days of rain, makes pleasant gurgling sounds as it winds southward. The trail has quite a steep incline here for an old rail bed and you can imagine the old steam trains puffing their way up the hill at -— what? — 10 miles per hour or less , having to slow down from their customary 20 mph speed. At Dutch Girl Road, the stream is right next to the trail, but thick vegetation dissuades closer inspection (watch for poison ivy, it's rampant). Dutch Girl Road is a small but accessible gravel road. It turns into a private road at the trail. There are a couple of houses close by. As you get close to Tuftsville Road, you'll see fields and a backyard or two. (Notice the double horseshoe pits on the left.) Once at the road, a further 100 metres will get you to the junction where the Trail of Two Lakes (the old Belleville and North Hastings Railway line) begins. How to get there: Belleville is in central Ontario in the Highway #401 corridor. From Highway #401, take the Highway #37 cutoff (the easternmost cutoff into Belleville. Drive 2.4 kilometres south on Cannifton Road to Station Street. From there, it's just over half a kilometre to the station, on the right (north) side. Total distance from #401 to the station: 3 kilometres. To avoid having to cross the tracks, head down Cannifton for two kilometres to College Street (the first set of lights before going under the tracks) and head left (east) half a kilometre to where Pearl Street heads north. There's plenty pf parking here. Walk south to the (active) rails then turn left to where the abandoned line curves north. From Highway #401 at Belleville, drive 14.5 kilometres north on Highway #62 to Tuftsville Road. Turn left onto Tuftsville (Clearview Road is off to the right). The road winds about for 1.5 kilometres, making first a sharp right (north) then left (west). The trail runs at a slight angle to the road at the bottom of a small hill. The actual junction of the grand Trunk and the Belleville and North Hastings Railway (The Trail of Two Lakes) is a short walk north of Tuftsville Road.